Once again I apologize for the non-professional image I am about to post but I am so overwhelmed with excitement about this work in the Mirage that I have to post this pic I found on TripAdvisor. As I mentioned in several previous posts, I have two paintings going in 707 of the newly remodeled rooms at the Mirage and I haven't received any glamour shots yet, nor have I had a chance to get out there, so I am posting the photos I have found on line. 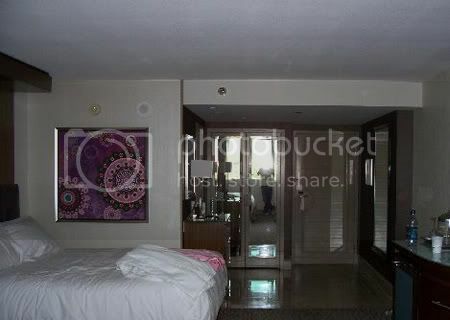 Trip Advisor member Michaela just got married in Vegas in April and posted this pic of their room. That's my artwork! Yippee! I can't believe it! And I can't wait to go see it!